Air fresheners are very popular these days, sold by so many brands with more scents and styles showing up on store shelves at this time of year, wrapped up in colorful seasonal papers and labels. 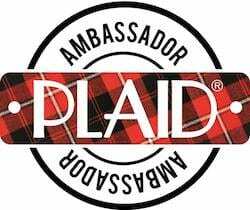 Many of these can be quite expensive, and many of these have overwhelming scents. For those with allergies, or an aversion to strong smells, these air fresheners can actually wreak havoc. Ready for how easy it is? In my case, I knew that I wanted a fir tree scent. Something that wasn’t pine-scented to the point of smelling like I just cleaned my house with pine cleaner, but more like being in a wonderful fir tree forest. I found the perfect scent in an essential oil. Essential oils are sometimes confused with perfumed oils or fragrance oils. They are not the same. Perfume oils and fragrance oils are synthetic, meaning they are chemically made in a lab somewhere. Essential oils are all-natural essences that have been derived from plants, trees, leaves and flowers. And that’s my limited chemistry lesson for you today! After doing some research (i.e. surfing on Google) on the different scents available, I chose to purchase Fir Needle Essential Oil by Nature’s Kiss via Amazon.com. 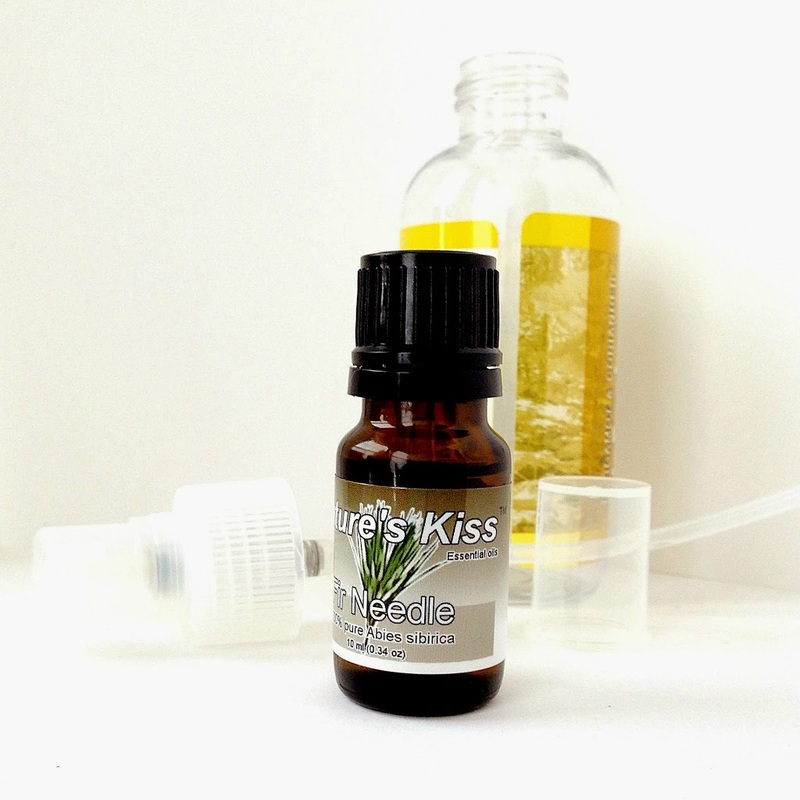 Nature’s Kiss Fir Needle Essential Oil has an aroma that resembles walking through a beautiful forest in that it is a rich, woody, invigorating and balsamic of medium strength with a middle note. It is a very calming aroma that puts you in touch with nature. The aroma is fantastic and familiar for Winter holidays. Sounds perfect, right? I usually use a pine-fir needle scent in our home starting right around now, in mid-November. It’s a peaceful scent that carries us through the holidays and into the Winter months. And with the stresses that can sometimes arise with the holidays, I love the idea of a calming aroma, although my husband might want to just douse me with the entire bottle as a preventive measure… Did I just type that? 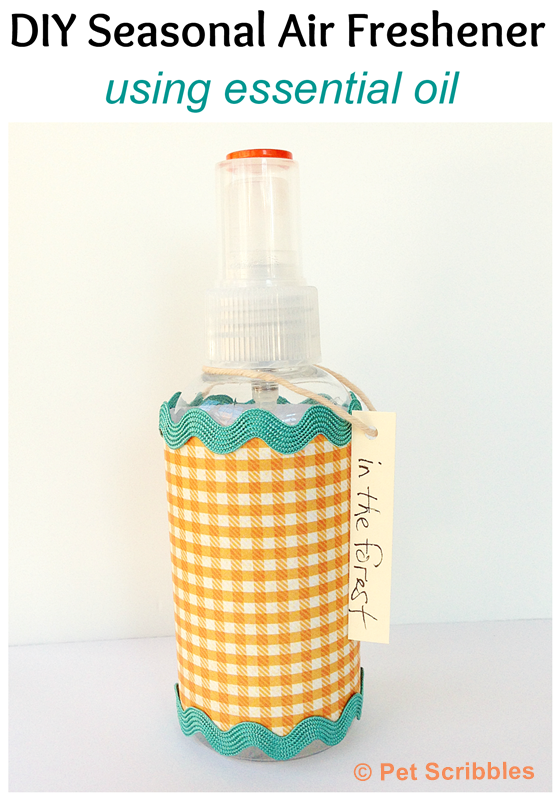 I had saved an empty spray bottle from one of our favorite air fresheners by Trader Joe’s, just for this purpose! 1. Put 3 to 5 drops of essential oil into the spray bottle. 2. Fill the bottle with water about 3/4 full. Depending on the size of your bottle, begin with about 3 to 5 drops of essential oil, then you can test and smell and decide if you need to add more drops. The water and the essential oil don’t mix – think of some homemade salad dressings as an example – and so you need to shake well to mix them up before spraying. 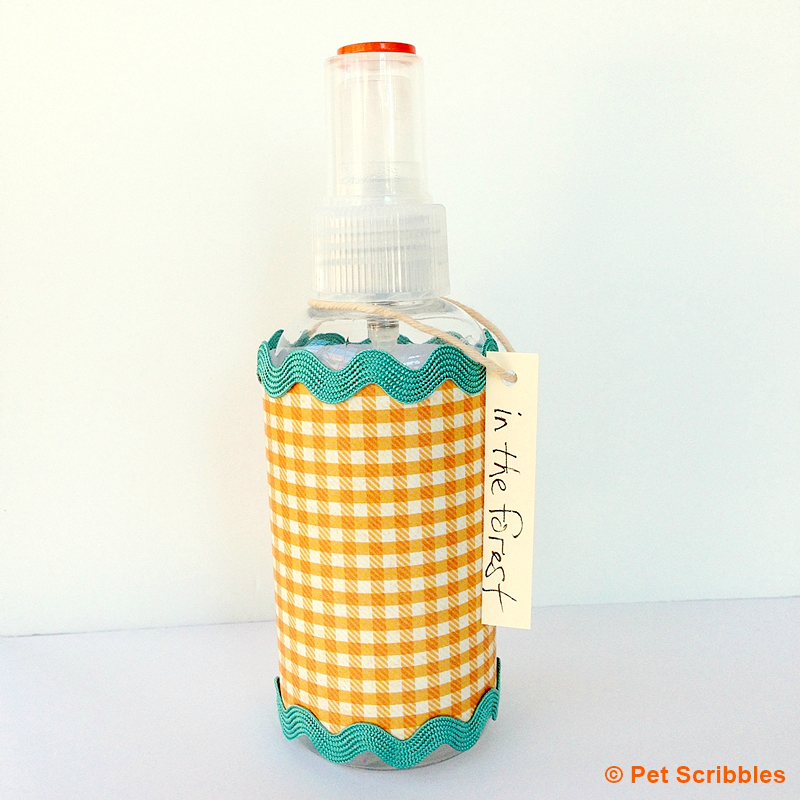 Cut decorative scrapbook paper to fit around your bottle and adhere with glue dots or an adhesive tape runner. I also added a bright orange button on the top of the cap. 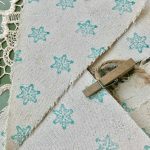 The final touch was a bit of trim and a little tag attached with some tea-stained twine. I call my homemade scent in the forest. 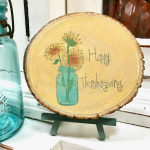 As I mentioned earlier, this would be a sweet hostess gift idea for Thanksgiving and holiday gatherings, as well as a thoughtful gift for teachers, friends and family members. Think small bottles as stocking stuffers, larger bottles as gifts. And if you choose a scent that isn’t feminine, like this fir needle scent, it makes a great gift for men! Want to see more scented ideas? 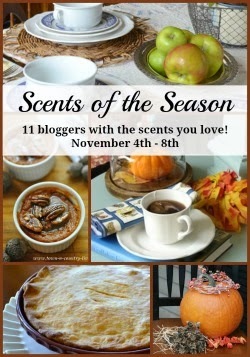 There’s plenty more in the Scents of the Season series. 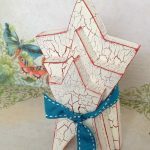 Click on the blogs listed below to see the scented projects and ideas shared every day this week! So… what is your favorite scent of the season? Do you stick with one scent for Thanksgiving and Christmas, or do you mix it up? 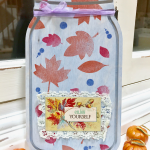 What a lovely handmade gift idea Laura and perfect for our own homes. I make my own scented products too and particularly like that I can vary the strength of the scent. I agree…. often those commercial ones are a little too overwhelming. Here’s a little tip for you (and I hope you don’t mind me sharing this)… by adding a couple of drops of Vodka to the mix the water and oil will mix into one. This reminds me that I need to make more lavender spray! 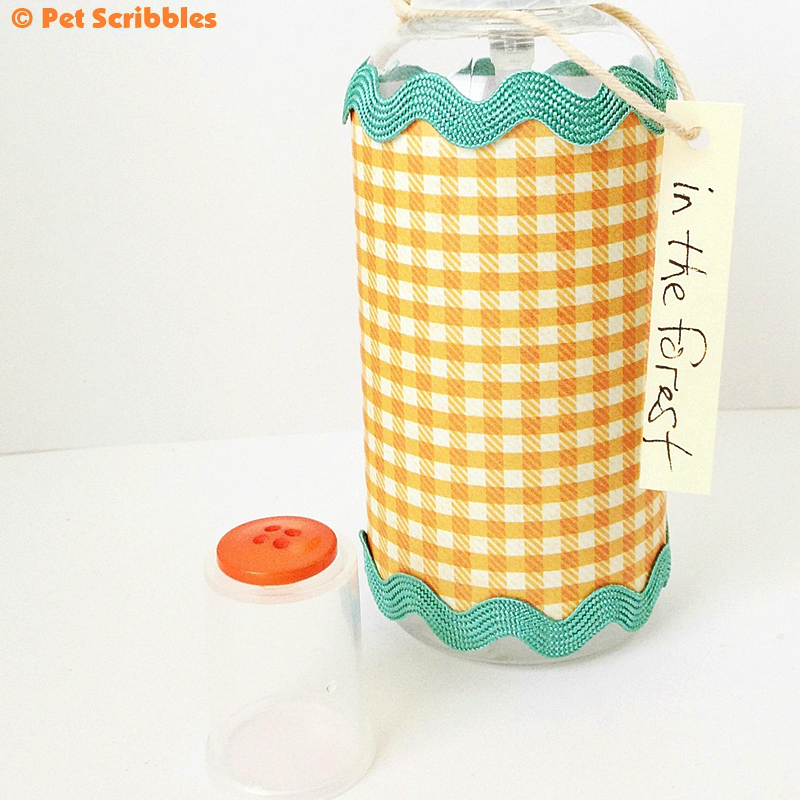 Love the way you decorated the bottle with gingham and rick rack!! Oooh, lavender spray sounds sooooo good! 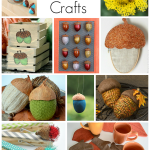 I’ll be asking you for some tips to make that! Decorating the bottle was fun, and I’m already thinking of ideas for decorating gift bottles for the holidays! What a great idea Laura! I bet your linens smell amazing! Why thank you, Linda! I really appreciate it! What a great original idea! I am longing for some of this right now! Pinning of course. 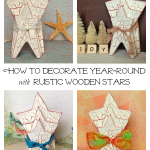 I love this idea and I’m surely going to try making some of your air freshener. You’re welcome, Kathy! 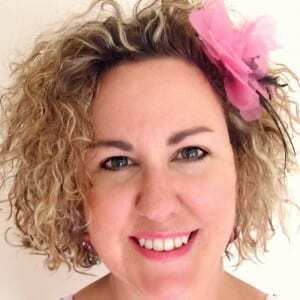 You know I really enjoy your weekly Blog Hop – it’s so much fun!